Yurgel, S. N., Sa, N., Rice, J. and Roje, S. (2014). Assay for GTP Cyclohydrolase II Activity in Bacterial Extracts. Bio-protocol 4(15): e1198. DOI: 10.21769/BioProtoc.1198. Riboflavin is the precursor of flavin nucleotides FMN and FAD, they play significant roles in all organisms. GTP is the initial precursor on riboflavin biosynthesis pathway and GTP cyclohydrolase II catalyzes the first step of this pathway. It converts GTP to 2,5-diamino-6-ribosylamino-4 (3H) -pyrimidinone 5'-phosphate. This protocol provides a reliable and fast method to assay GTP cyclohydrolase II activity from crude bacterial extracts. The product of the reaction catalyzed by GTP cyclohydrolase II, 2,5-diamino-6-ribosylamino-4 (3H) -pyrimidinone 5'-phosphate, is converted to its fluorescent derivative 6,7-dimethylpterin, which is then separated on a XTerra MS C18 column and detected using fluorescence HPLC system. Grow cells for 48 h at 30 °C, 250 rpm in 14 ml Falcon or glass tubes. Dilute the cells 20-fold into 10 ml fresh MMNH4 medium and grow overnight at 30 °C, 250 rpm in 50 ml glass tubes or flasks. Harvest cells from 10 ml culture by centrifugation at 3,600 x g for 15-20 min at 4 °C in 14 ml Falcon tubes. Discard the supernatant and wash the cells with 5 ml 50 mM Tris buffer at 4 °C. Resuspend the pellet in 1 ml of lysis buffer at 4 °C. Incubate at room temperature for 15 min, without shaking. Centrifuge the lysate at maximum speed for 15 min at 4 °C. Measure protein concentration in the cell lysates using Bio-Rad Protein Assay Kit. This assay protocol was adapted from a method for assaying GTP cyclohydrolase II activity in the purified enzyme (Bacher et al., 1997) and modified for using with bacterial extracts. Desalt the cell lysate using 2 ml Zeba Spin Desalting Columns following the manufacturer’s instructions. The column was equilibrated with 3 ml desalting buffer. Add 25 µl of the desalted whole cell lysate form the previous step in a total volume of 50 µl reaction mixture containing 10 µl 5 x RibA assay buffer, 5 µl 10 mM GTP (prepare GTP in ultrapure water). Incubate the assay at 37 °C for 30 min. Terminate the assay by adding 2.5 µl EDTA (0.5 M, pH 8.0). Derivatize the product by adding 50 µl of the derivatization reagent, followed by incubation at 70 °C for 20 min. Clear the samples by centrifugation at 3,000 x g for 10 min at 4 °C. Filter the supernatant using a 0.22 µm syringe filter. Analyze the derivatization products using HPLC with fluorescence detection. Separate the fluorescent products on a XTerra MS C18 column (4.6 x 100 mm, 5 µm) using a Waters Alliance 2695 HPLC system linked to a 2475 fluorescence detector. Excitation and emission wavelengths are 330 nm and 435 nm, respectively. Quantify the products by comparison to standards. 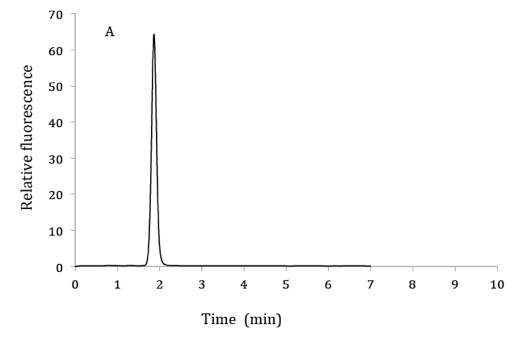 A standard curve was obtained by running sequential dilution of 6,7-dimethylpterin (0.25 nM, 2.5 nM, 25 nM, 0.25 µm, 2.5 µM and 25 µM) on HPLC. Normalize the enzyme activity against protein concentration and assay incubation time in nmol/min/mg protein. Perform three replicates on each assay. Data is the average ± S.E. of three replicates. Note: The activities of GTP cyclohydrolase II vary in different organisms. 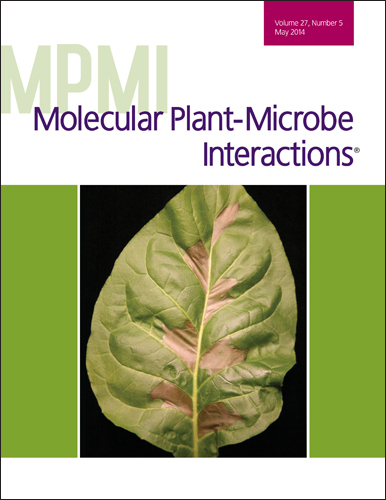 The activity of purified recombinant enzymes have been reported from about 0.1- 182 nmol/min/mg protein, the activity in bacterial extracts can be lower (Herz et al., 2000; Kaiser et al., 2002; Yurgel et al., 2014). Figure 1. 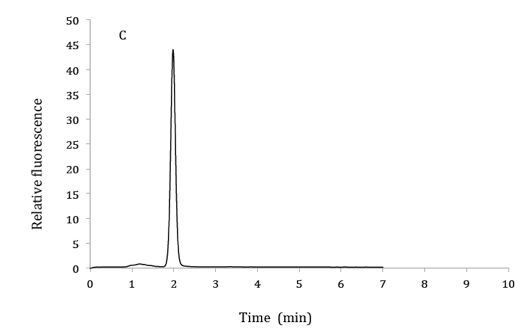 HPLC chromatograms of 2.5 µM 6,7-dimethylpterin standard (A), product of GTP cyclohydrolase II assay from bacterial extracts (B) and co-elution of product from GTP cyclohydrolase II assay with 6,7-dimethylpterin standard (C). HPLC mobile phase: 10% methanol and 90% phosphoric acid (v/v). Excitation and emission wavelengths were 330 nm and 435 nm respectively. Bacher, A., Richter, G., Ritz, H., Eberhardt, S., Fischer, M. and Krieger, C. (1997). Biosynthesis of riboflavin: GTP cyclohydrolase II, deaminase, and reductase. Methods Enzymol 280: 382-389. Herz, S., Eberhardt, S. and Bacher, A. (2000). Biosynthesis of riboflavin in plants. The ribA gene of Arabidopsis thaliana specifies a bifunctional GTP cyclohydrolase II/3,4-dihydroxy-2-butanone 4-phosphate synthase. Phytochemistry 53(7): 723-731. Kaiser, J., Schramek, N., Eberhardt, S., Puttmer, S., Schuster, M. and Bacher, A. (2002). Biosynthesis of vitamin B2. Eur J Biochem 269(21): 5264-5270. How to cite: Yurgel, S. N., Sa, N., Rice, J. and Roje, S. (2014). 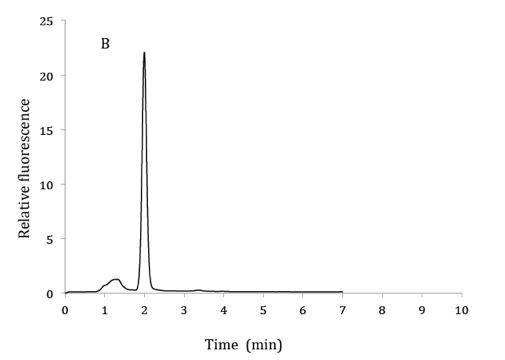 Assay for GTP Cyclohydrolase II Activity in Bacterial Extracts. Bio-protocol 4(15): e1198. DOI: 10.21769/BioProtoc.1198.